as seen from Sulmona, Abruzzo, Italy. Credit and copyright: Giuseppe Petricca. If you took a picture of the Sun every day, always at the same hour and from the same location, would the Sun appear in the same spot in the sky? A very fine image, compiled by astrophotographer Giuseppe Petricca from Italy, proves the answer is no. "A combination of the Earth's 23.5 degree tilt and its slightly elliptical orbit combine to generate this figure '8' pattern of where the Sun would appear at the same time throughout the year," said Petricca. over the course of 2015, as seen from Sulmona, Abruzzo, Italy. 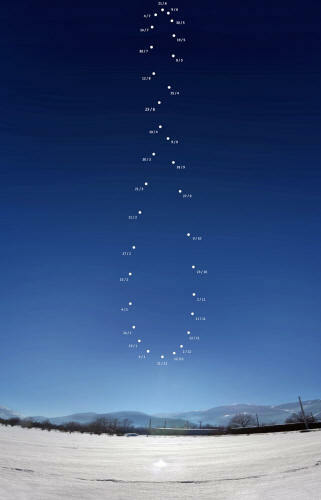 The analemma is considered by many to be one of the most difficult and demanding astronomical phenomenon to image. 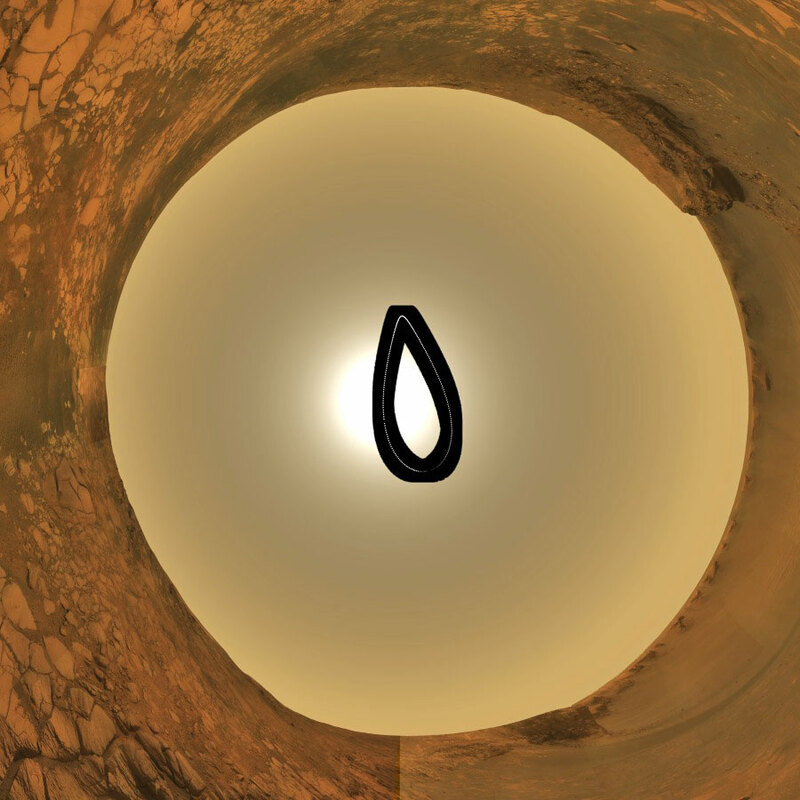 Astrophotographers need to dedicate an entire year to the project. It requires diligence to take images 30 to 50 times throughout the year at the same time of day and same location. It is interesting to note that analemmas viewed from different Earth latitudes have slightly different shapes, as well as analemmas created at different times of the day. Also, analemmas on the other planets have different shapes. 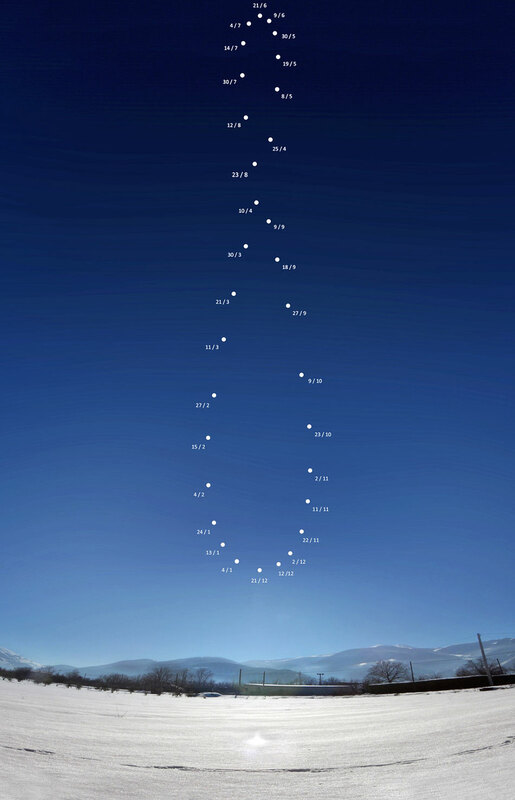 showing the Sun's movements over one Martian year. between July, 16, 2006 and June 2, 2008. If the Earth were not tilted, and if its orbit around the Sun were perfectly circular, then the Sun would appear in the same place in the sky throughout the year. But then, we also wouldn't have seasonal change, so I vote to keep axial tilt! 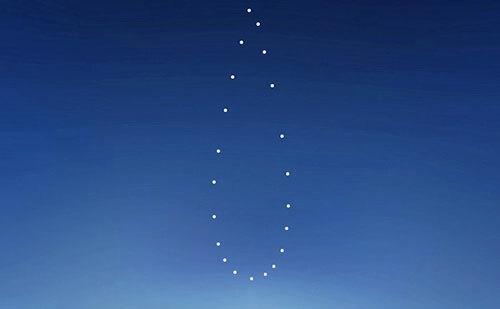 annotated with the dates each picture of the Sun was taken. "I was lucky to have the last year with good sunny skies at the right times, even if some months were really difficult to image," he explained via email. "The background view is the one from the first picture, January 4th, 2015, after three days of snow." Petricca used a Nikon Coolpix P90 Bridge Camera mounted on a fixed tripod, with images taken from a field nearby his home Sulmona, Abruzzo, Central Italy. "To take pictures of the solar disk I used an Astrosolar filter in front of the camera, then I composed the analemma digitally, via Photoshop CC," he said. Also the Stanford University Solar Center has a page about it, with analemmas taken from around the world.